I wish I could accurately put into words how much I adored This is Really Happening. I didn’t know a lot about this book when I first read it, but I had seen great reviews so I was hoping it would be good. It wasn't until I was halfway into the book, laughing hysterically to myself on the 6 train, that I realized how much I loved it. A book has to be good is you’re willing to face the weird and partially annoyed looks of train passengers. This is Really Happening, like most great books, is unique and unexpected. Over the past couple of years I’ve had to read several non-fiction books, mainly for school, and although they all are books are REAL life, I never found one that connected with me as much as fiction books have. There have been very, very few non-fiction books that I truly enjoyed or would re-read (two lol), and This is Really Happening is on that small list. FIND YOUR CARROT. This one was my favorite, mainly because it made me laugh so hard. I went back to my book just now to find the name of this story and re-read it and also just burst out laughing AGAIN. It’s that good and no, I’m not saying anything about it, you just have to read it. GIRL-SHAPED TORNADO. This is the first story, and it’s about Erin telling her friends she has cancer. The best part is when she tells her friend Jordan and it possibly the weirdest, most hilarious way possible. This is the one that made me embarrass myself on the train (worth it, though). GREENER PASTURES. 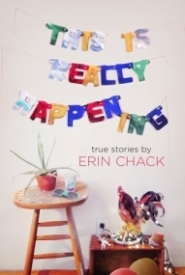 This is one of the deeper stories, and Erin talks about her feelings and thoughts when it comes to death. “And it’s sweet to think that most of us don’t want to go, like life is a party that’s too fun to leave.” It actually really made me realize how much people avoid talking about death, even though it is such a big part of life? It will definitely give you a lot to think about. This is a book pretty much anyone could love. I’m already planning on getting a couple of copies for my sister and some of my friends who don’t read, cause I know even they would love it. It’s that good. Everyone needs this book in their life, just trust me on this. If you need some laughter and hope in your life, I would grab this book whenever you get the chance.